Your Craft links for early November. Fall is in full swing, at least from where I'm sitting, and the Craft CMS links are dropping like leaves from a tree. Ok... I'm stretching it a bit there, but there are many good Craft links for you again this issue. If you're interested in generating JSON from your Craft install, be sure to check out the Element API video in the Tools, tips and fundamentals section. 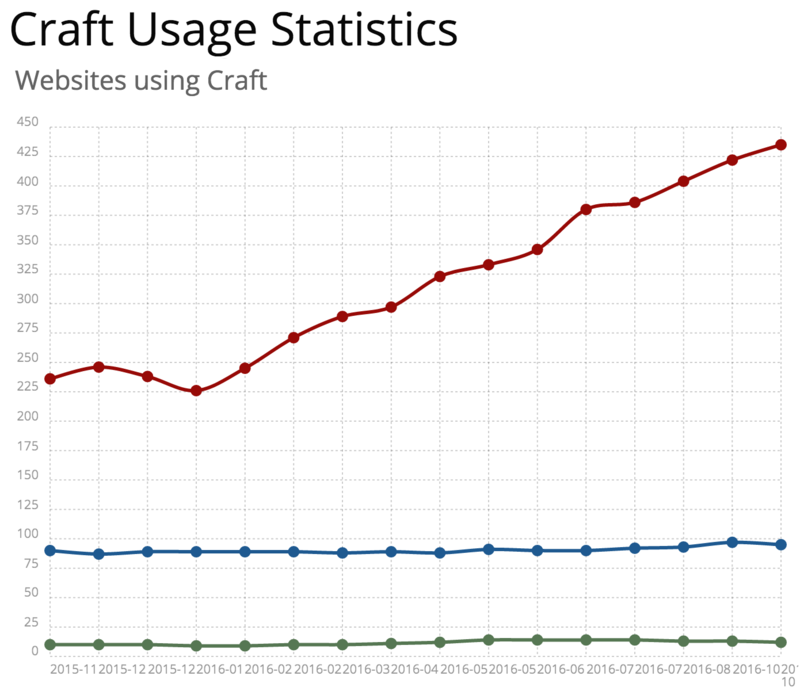 Plus, there's also a nice graph, if you like Craft and you like graphs, to kick off the issue. Who doesn't like a good graph now and then? Lastly, as this issue was close to publishing, there was a tweet that said you might need to manually update to Craft 2.6.2950. Thought it was worth mentioning in case this happens to you. Licensing in Craft is smooth as butter, but that doesn't mean you don't have questions. On April 26th–28th, 2017, Peers Conference goes West. See the real-life faces behind all those Slack thumbnail images. If you're interested in locking down your Craft control panel with 2-factor authorization, you can vote on the feature request here. A free 40-minute lesson from Mijingo on makin’ JSON. How do I export Craft search results as a CSV? Matrix within Matrix. Part 2. Neo. This is a follow up to Matrix within Matrix. Part 1. Super Table, which was mentioned in the previous issue of Craft Link List. Pelle Beckman has started a list of Craft CMS resources on GitHub. What is the recommended Nginx configuration for Craft? Solspace brings Freeform to Craft CMS. A powerful form building plugin that gives you full control to create simple or complex forms. ImageResizer: A Craft CMS plugin to resize images on upload. The Plus plugin for CraftCMS adds an easy to use way of attaching behaviors to your elements using Craft's own $element->attachBehavior() method. In addition Plus adds a useful global variable 'plus' that will expose all available services you create within the Plus\Services namespace. The Craft Podcast interviews Patrick Harrington and Marko Srdoč. 10 Problems a CMS won't solve and how to find the solution. A developer shares "a few things that have helped me to resolve some of the anxiety around Building Big Things™." "Only" may not be the word I'd pick, but, hey, I'm just sharing the link. Security alert since you're probably (or most definitely) using Linux.